The Buccaneers first ever victory against the New Orleans Saints came during the first game Sunday, December 11, 1977 - Actually, this game played in the Superdome, was the first ever win in Buccaneers franchise history. The Buccaneers play the Panthers on average twice-a-season once the Saints moved into the NFC South Division in 2002. Considered a rival team the compitition between the Bucs’ & Panthers have also meet during several pre-season encounters. Below click on ANY date to view extensive details of all gameday encounters. We have featured details of each opponent, highlights of each games statistics, players, scoring details, media coverage, photographs with a detailed game report. Below the listed dates we also include full details of the Opponent. The name "Saints" is an allusion to November 1 being All Saints Day in the Catholic faith, New Orleans' large Catholic population, and the spiritual "When the Saints Go Marching In", which is strongly associated with New Orleans and often sung by fans at games. The franchise was founded on November 1, 1966. The team's primary colors are old gold and black; their logo is a simplified fleur-de-lis. They played their home games in Tulane Stadium through the 1974 NFL season. The following year, they moved to the new Louisiana Superdome (now the Mercedes-Benz Superdome, since Mercedes-Benz has purchased the stadium's naming rights). For most of their first 20 years, the Saints were barely competitive, only getting to .500 twice. In 1987, they finished 12–3—their first-ever winning season—and qualified for the NFL playoffs for the first time in franchise history, but lost to the Minnesota Vikings 44–10. The next season of 1988 ended with a 10–6 record. In the year 2000, the Saints defeated the St. Louis Rams 31–28 to notch their first-ever playoff win. In 2005, Hurricane Katrina devastated New Orleans and much of the Gulf Coast region. The Superdome was used as an emergency temporary shelter for displaced residents. The stadium suffered damage from the hurricane (notably from flooding and part of the roof being torn off as well as internal damage), and from lack of available facilities. The Saints were forced to play their first scheduled home game against the New York Giants at Giants Stadium in East Rutherford, New Jersey (the Giants' home stadium); other home games were rescheduled at the Alamodome in San Antonio, Texas or Tiger Stadium in Baton Rouge, Louisiana. During the season, it was rumored that Saints owner Tom Benson might deem the Superdome unusable and seek to legally void his contract and relocate the team to San Antonio, where he has business interests. Ultimately, however, the Superdome was repaired and renovated in time for the 2006 season at an estimated cost of US$185 million. The New Orleans Saints' first post-Katrina home game was an emotionally charged Monday Night Football game versus their division rival, the Atlanta Falcons. The Saints, under rookie head coach Sean Payton and new quarterback Drew Brees, defeated the Falcons 23–3, and went on to notch the second playoff win in franchise history. 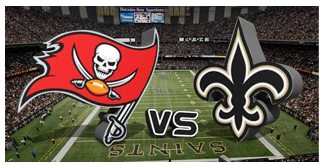 The Saints have a developing rivalry with the Tampa Bay Buccaneers, who have been part of the NFC South with the Saints since 2002. The teams actually played each other quite often as non-division rivals. Between 1977 and 2001, there were only five years in which the teams did not play. This includes 12 years in a row from 1981 to 1992 – all as a result of the scheduling formulas in place prior to 2002 (this remains a record for most consecutive years in which two teams not from the same division met each other). The Saints won 13 of 20 games as non-division opponents. Since becoming division rivals, the Saints have the edge in the series. The Saints' oldest rival is the Atlanta Falcons. The Falcons lead the rivalry series 49–45. The two clubs joined the NFL within a year of each other as expansion teams and have played each other twice a season since the Saints joined the league in 1967. In their last game in the 2014 NFL season, a fight between the players broke out in the end zone and spilled out into the tunnel entrance after a Cam Newton touchdown, with Panther's tight end Brandon Williams getting ejected and both teams receiving offsetting penalties. The Panthers won the contest 41–10, with early turnovers by the Saints being a factor in the blowout. The New Orleans Saints' rivalry with NFC counterparts Dallas Cowboys is more of a regional rivalry rather than a divisional one as the two franchises have never competed in the same division since the last time both clubs were in the same division, in 1969, as a part of the NFL Capital Division, before the AFL–NFL merger in 1970. Their fanbases overlap in parts of northern Louisiana, such as the Shreveport – Bossier City metropolitan area which borders the state of Texas. The teams have played each other 27 times, with New Orleans owning the recent series winning 8 out of the last 10 games. The Saints have won 4 of the last 5 meetings in Dallas, with a 2–1 record at Cowboys Stadium. The all-time series record stands at 12–16, in favor of Dallas. The two teams most recently met on October 4, 2015, which the Saints won 26–20 in overtime in New Orleans. In the teams' most recent meeting at the Superdome, the Saints set a National Football League record of 40 first downs and a franchise record of 625 yards of total offense with Texas native Drew Brees throwing four touchdown passes without any interceptions for the 15th time in his career. Additionally, the Saints' defensive coordinator was Rob Ryan, who had been let go by the Cowboys earlier that year, and Ryan's replacement Monte Kiffin was demoted from the position at the end of the 2013 season. First the brainchild of local sports entrepreneur Dave Dixon, who also founded the Louisiana Superdome and the USFL, the Saints were actually secretly born in a backroom deal brought about by U.S. Congressman Hale Boggs, U.S. Senator Russell Long, and then–NFL Commissioner Pete Rozelle. The NFL needed congressional approval of the proposed AFL–NFL merger. Dixon and a local civic group had been seeking an NFL franchise for over five years and had hosted record crowds for NFL exhibition games. To seal the merger, Rozelle arrived in New Orleans within a week, and announced on November 1, 1966, that the NFL officially had awarded the city of New Orleans an NFL franchise. The team was named for the great jazz song most identified with New Orleans – "When the Saints Go Marching In", and it was no coincidence that the franchise's official birth was announced on November 1, which is the Catholic All Saints' Day. When the deal was reached a week earlier, Dixon strongly suggested to Rozelle that the announcement be delayed until then. Dixon told an interviewer that he even cleared the name with New Orleans' Archbishop Philip M. Hannan: "He thought it would be a good idea. He had an idea the team was going to need all the help it could get." Current Saints owner Tom Benson acquired the franchise in 1985, and hired Jim Finks as general manager and Jim Mora as head coach. That combination provided the Saints with their first-ever winning record and playoff appearance, going 12–3 in 1987, which had one fewer game than normal due to a players' strike. Another playoff berth would follow in 1991, and the club's first division title came in 1991. During Mora's tenure, the Saints made the playoffs four times, with teams marked by strong defenses led by the "Dome Patrol" linebacking corps, but they were never able to win a playoff game. Mora coached the Saints until the middle of the 1996 season, when he stepped down halfway through the 3–13 season. His 93 wins are still a franchise record, and are three more than the Saints won in their entire history prior to his arrival. Jim Haslett held the post from 2000 to 2005. In his first year, he took the team to the 2000 playoffs and defeated the defending Super Bowl champion St. Louis Rams for the team's first ever playoff win. The team lost the following week to the Minnesota Vikings. After winning the 2000 NFL Executive of the Year Award, General Manager Randy Mueller was fired between the 2001 and 2002 seasons without explanation by Benson. The Saints failed to make the playoffs in 2001 and 2002, although in the latter year they had the distinction of beating the eventual Super Bowl XXXVII champion Tampa Bay Buccaneers in both of their regular season meetings, only the second team to do so in NFL history. The 2009 season was the team's most successful season, which culminated in the franchise's first league championship win against the Indianapolis Colts in Super Bowl XLIV. After achieving a record of 13–0 with their win over the Atlanta Falcons, it marked the Saints' best start to a season in its franchise history. The result clinched an NFC playoff berth, a bye in the first round of the playoffs. By winning their first 13 games, the Saints also set the record for the longest undefeated season opening (13–0) by an NFC team since the AFL–NFL merger, surpassing the previous record (12–0) held by the 1985 Chicago Bears. However, they would fall victim to the Dallas Cowboys in week 14, going on to end the season with a three-game losing streak. Saints became the first team to win a Super Bowl after losing its last three regular season games. After a lengthy investigation conducted by the National Football League's security department, the league alleged on March 2, 2012, that 22 to 27 defensive players on the New Orleans Saints maintained a "pay for performance" program that included "bounty" payments administered by then–defensive coordinator Gregg Williams during the 2009, 2010 and 2011 seasons. NFL Commissioner Roger Goodell stated, "The payments here are particularly troubling because they involved not just payments for 'performance,' but also for injuring opposing players." The report also found that head coach Sean Payton was aware of the allegations but failed to stop the program. The league also said that Mickey Loomis, the Saints' general manager, was directed to end the program by owner Tom Benson, but didn't. The memo released to NFL teams found Payton and Loomis guilty of "conduct detrimental" to the league. However, on July 26, 2012, Jonathan Vilma and seven witnesses from the Saints testified in front of a federal judge in New Orleans that NFL commissioner Roger Goodell got his facts wrong in the bounty scandal. "Everybody was sworn in under oath in front of a judge with the risk of perjury and jail time if we were lying, and categorically denied there was a bounty", Vilma said in a text message to ESPN's Ed Werder. "Seven people testified, 2 sworn affidavits (one by Drew Brees) all saying the same thing. I ask that you and ESPN report the facts. No more bias or b.s. or hearsay. I gave you facts that you can report if so choose." Black, along with old gold and white, has always been one of the team colors, but it wasn't the first choice of original majority owner John W. Mecom Jr. His preference was for Mecom blue, a medium shade which was used by all of his other investments. The NFL office, however, informed him that his proposed combination too closely resembled that worn by the San Diego Chargers. Although the Chargers were members of the AFL, the older league didn't want to offend its soon-to-be partner so soon after the merger. Mecom settled on black as the primary color as a nod to his financial involvement in the petroleum industry. "Black gold" is a term synonymous with oil. Although the Pittsburgh Steelers—who played a few home games in New Orleans during their early years to avoid conflict with the Pittsburgh Panthers football team—have long used black and gold as their colors, their shade of gold more closely resembles yellow, making the Saints black and gold compatible with the rest of the NFL. The Mercedes-Benz Superdome, often referred to simply as the Superdome, is a domed sports and exhibition venue located in the Central Business District of New Orleans, Louisiana. 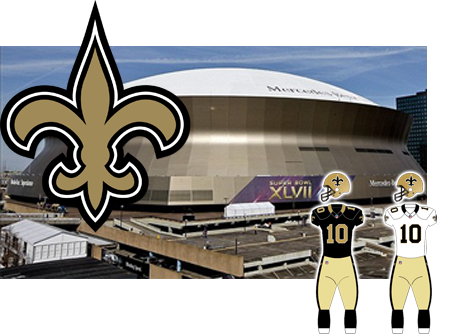 It primarily serves as the home venue for the New Orleans Saints of the National Football League (NFL), and is also the home stadium for the Sugar Bowl and New Orleans Bowl in college football. Plans were drawn up in 1967 by the New Orleans modernist architectural firm of Curtis and Davis and the building opened as the Louisiana Superdome in 1975. Its steel frame covers a 13-acre (5.3 ha) expanse and the 273-foot (83 m) dome is made of a lamellar multi-ringed frame and has a diameter of 680 feet (210 m), making it the largest fixed domed structure in the world. It is adjacent to the Smoothie King Center. Because of the building's size and location in one of the major tourist destinations of the United States, the Superdome routinely hosts major sporting events, including the Super Bowl, College Football Championship Game, and the Final Four in college basketball. The stadium was also the long-time home of the Tulane Green Wave football team of Tulane University until 2013 and was the home venue of the New Orleans Jazz of the National Basketball Association (NBA) from 1975 until 1979. On October 3, 2011, it was announced that German automaker Mercedes-Benz purchased naming rights to the stadium. The new name took effect on October 23, 2011. At that time, it was the third stadium that has naming rights from Mercedes-Benz (and first in the United States), after the Mercedes-Benz Arena, the stadium of Bundesliga club VfB Stuttgart, in Stuttgart, Germany, and the Mercedes-Benz Arena in Shanghai, China. Atlanta's Mercedes-Benz Stadium (home of the Falcons, who, like the Saints, also play in the NFC South), set to open in 2017, will become the fifth stadium (and second in the NFL) to bear the name of the German automaker. "It was a natural evolution of this idea that the dog be a Saint Bernard, and the name, Gumbo (a conglomeration of food and an iconic New Orleanian dish), reflects the Restaurant Association as well as a famous traditional Cajun meal loved by young and old, rich and poor (a mix like all people who love and support the Saints). Even though Gumbo went into a brief retirement, he was brought back by popular demand. For years, Gumbo was, in fact, a real Saint Bernard dog that roamed the sidelines in Saints' apparel for dogs. The reason for choosing this breed of dog is the fact that Orleans Parish (where the City of New Orleans lies) shares a border with St. Bernard Parish to the east. The present mascot consists of a person wearing a Saint Bernard dog head and a football uniform. He is usually seen on the sidelines during games near the goalpost and sometimes celebrates touchdowns with Saints players. 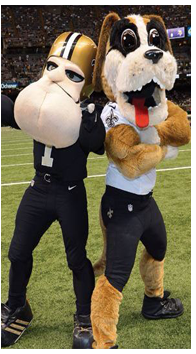 Sir Saint is the second official mascot of the NFL's New Orleans Saints, along with Gumbo the dog. Sir Saint is one of the original mascots of the Saints under former owner John Mecom, and was revived by the organization after several decades of hiatus.